Egg fried rice is one of the most popular Chinese dishes. It's a classic stir-fry that usually includes soya sauce, onions and eggs, along with various other vegetables. Similar stir fry dishes are very popular not only in China, but in all South Asia and India as well! What we did in this recipe, was blending some of the amazing Indian spices, with this Chinese stir-fry, making a curry Indo-Chinese version instead of the classic Chinese recipe. Our curry egg fried rice includes a lot of onion in slices (like many Indian classic recipes), garlic, eggs and of course basmati rice. All these are beautifully scented with a bit of turmeric and paprika, fennel seeds, some ground coriander and a lot of curry! The fennel seeds provide a sweet aroma which helps balancing the intense taste of the curry and the coriander. This is a very easy Asian recipe, suitable both for lunch and dinner, great for a fancy meal and also a great comfort food! 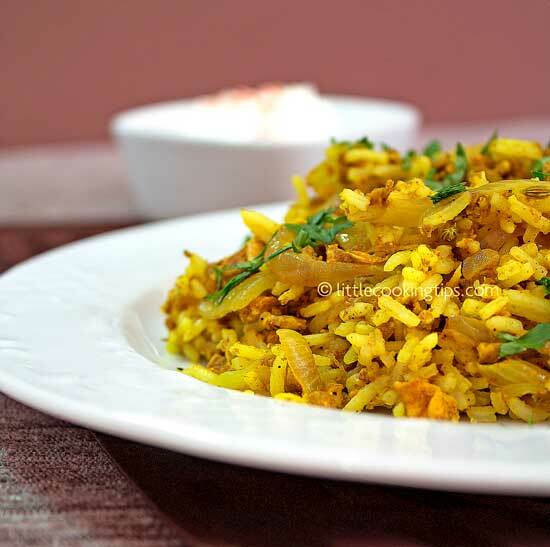 It's also ideal if you have some leftover rice; this way you can make another superb dish with it! We used Ghee in this recipe in order to saute our ingredients. Ghee is a clarified butter used for centuries in Indian cuisine. It enhances the taste and has a high smoke point when heated, making it a great choice as a frying fat. If you can't find Ghee feel free to use any vegetable oil, but for this specific dish, we strongly suggest it. The Ghee we prefer is 50% clarified classic butter and 50% clarified coconut butter, making it a bit healthier. So let's start cooking tasty curry egg fried rice! Preparation: Boil the rice in salted water, on medium to high heat. Once the water starts boiling, reduce the heat to medium-low. Simmer until all the water is absorbed. Stir occasionally. Remove from heat, cover with a kitchen cloth and leave aside. Heat the ghee in a large frying pan, on medium to high heat. Add the onions and saute for 6 minutes until it starts getting a bit fried. Then add the garlic and the fennel seeds. Stir for half a minute and then add the rest of the spices. Stir well until all ingredients are nicely combined. Cook for 2 minutes and add the eggs. Stir continuously for 2-3 minutes (the eggs should not form an omelet, they will be scrambled). Once the eggs are cooked well, add the rice. Again stir constantly, for 3 minutes until all the ingredients are combined. Remove from heat and serve. Kali oreksi! 1. When serving the rice, sprinkle with finely chopped fresh coriander on top (or fresh parsley). 2. This dish is best served warm with Greek yogurt on the side. 3. Fried rice is cooked over high heat so have your ingredients ready before you start cooking. 4. If you can't find fennel seeds, use a small pinch of anise seeds. feel like going back home and making some like this straight away !!! It won't take much time Sona! :) Let us know how it was if you make it!